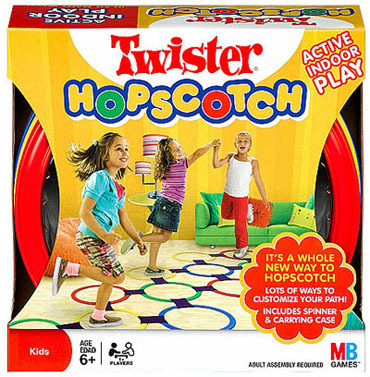 Twister Hopscotch is a new form of hop scotch. You can hop in a straight line, a diamond, a zig zag, or some other way that you make up. Hop on red; dance on blue. Establish a pattern with rigid rings and hopscotch according to a completely new way. The movable rings let you change your path and customoze your game. A great way to have interactive indoor fun. The party game includes thirteen rings, sixteen ring clips, spinner with arrow and base, carrying case and instructions. It comes with a gripping surface.